Hephaestus Sounds a company created by musician and composer Francesco Massa, and creates sample libraries for Native Instruments Kontakt and also Yamaha Tyros 5. 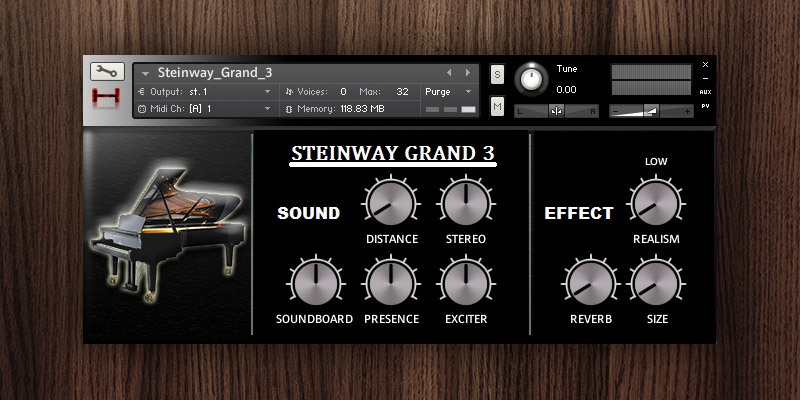 Steinway Grand 3 is a free Kontakt instrument. It is part of Gran Coda v.1.4, a concert piano sample library. The interface is simple and easy to use. A few controls make it possible to shape the piano sound. Distance control will increase the ambiance, making the sound closer or far. Stereo knob will widen the sound or make it mono-ish. Soundboard, Presence, and Exciter are EQ controls. The first one will set low frequencies to the sound. The second will work on mid frequencies, while the last one will affect high frequencies. At the right, there’s an effects section. It’s possible to add a room reverb to the instrument. A Size knob is also available. Low control is disabled since it is part of the full version. If you need a good grand piano virtual instrument, try Steinway Grand 3 for free. – Requires Kontakt full 5.2.1 or higher (it works only for 15 minutes on Free Kontakt Player). To download the free version, just go to Hephaestus Sounds website (http://www.sampleism.com/hephaestussounds/free-k5-steinway-grand-3).